Welcome to the new year! I’m settling in quite nicely to my fourth decade here on earth and genuinely can’t wait to see what 2016 has in store for all of us. Good things to come! I’ve spent the last few days organizing my place while reflecting on the past year. In the process, I’ve gotten rid of some excess stuff and decided that my focus for 2016 will be on giving, rather than obtaining. In hindsight, my twenties were all about growing into an adult and getting all of the adult things that come along with it. I graduated from college, got a job, got a dog, started my blog, hated and quit said job, and somehow managed to turn this blog into my career (best job ever!). I also traded in mismatched plates for a well-stocked kitchen, purchased a few pairs of boots, bought myself a grown-up car, and here I am at thirty, with more than enough. So now, I’m purposefully shifting focus. I’ve even sworn off buying clothes for the entire year, just for daily reinforcement that I have plenty. Anyone want to join me? 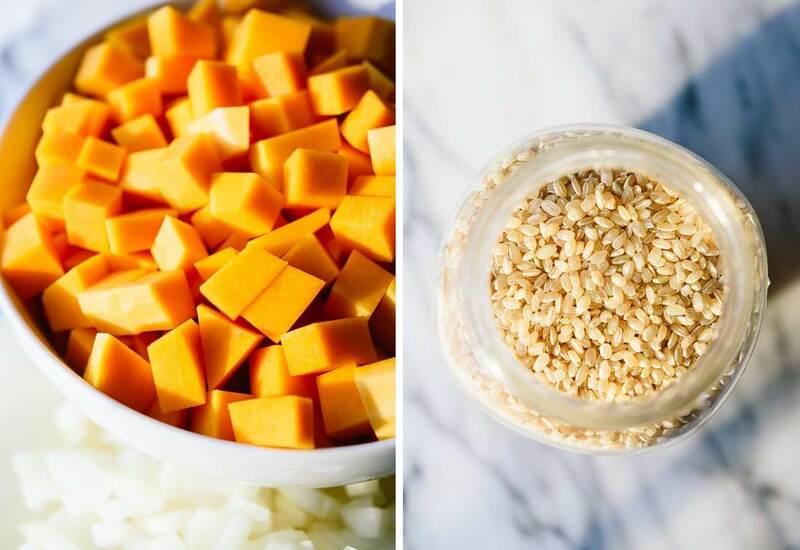 I thought we’d kick off 2016 and transition into healthier eating with this comforting, but redeeming, butternut risotto recipe. Unlike most risottos, this one calls for brown short-grain rice instead of white, which yields a super creamy risotto full of whole grain goodness. The only downside is that brown rice requires more cooking time than white, so I’ve switched from the traditional stovetop method to the oven. This way, you only have to stir the risotto for a few minutes at the end, rather than for fifty minutes straight. That’s a serious arm workout, by the way. While the risotto bubbles away in its pot, we roast cubed butternut on the top rack until it’s tender and caramelized on the edges. 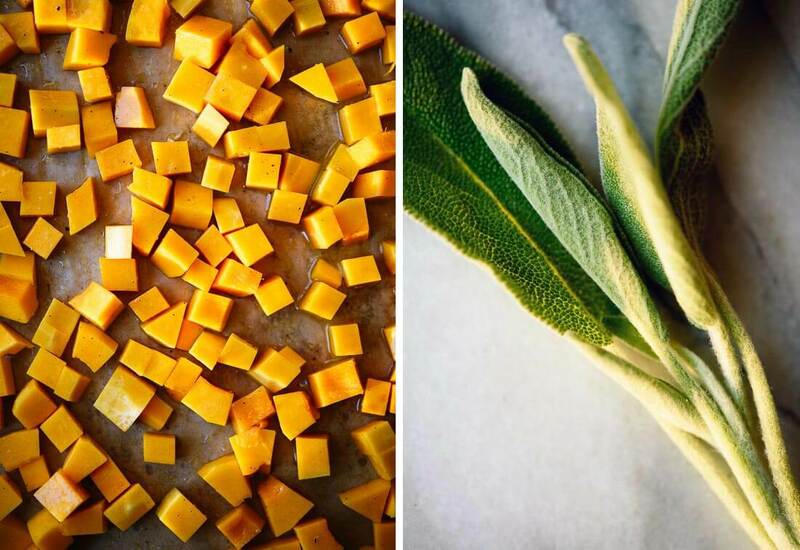 Then, just stir the rice and butternut together with a reasonable amount of butter and Parmesan and top it off with crispy fried sage. (Check the notes for a dairy free/vegan option.) This risotto is heavenly, I tell you. Here’s to healthy, happy eating in 2016! 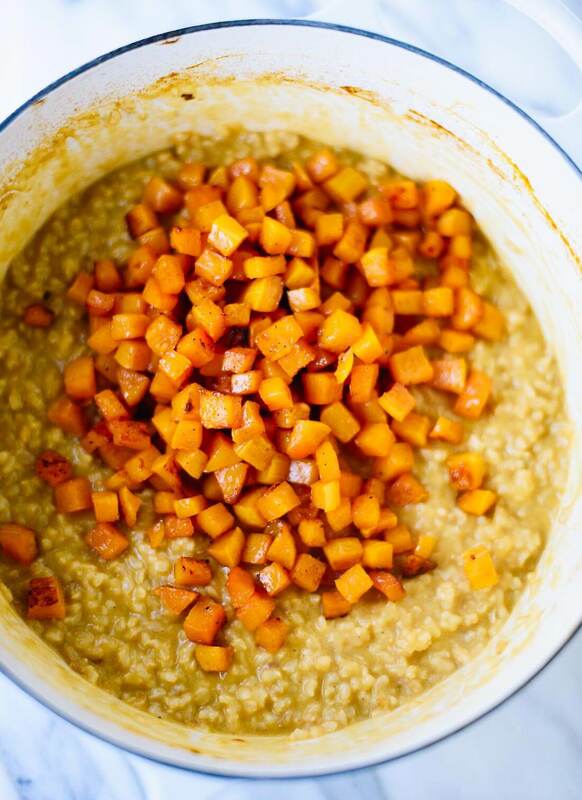 This butternut squash risotto recipe tastes incredible! 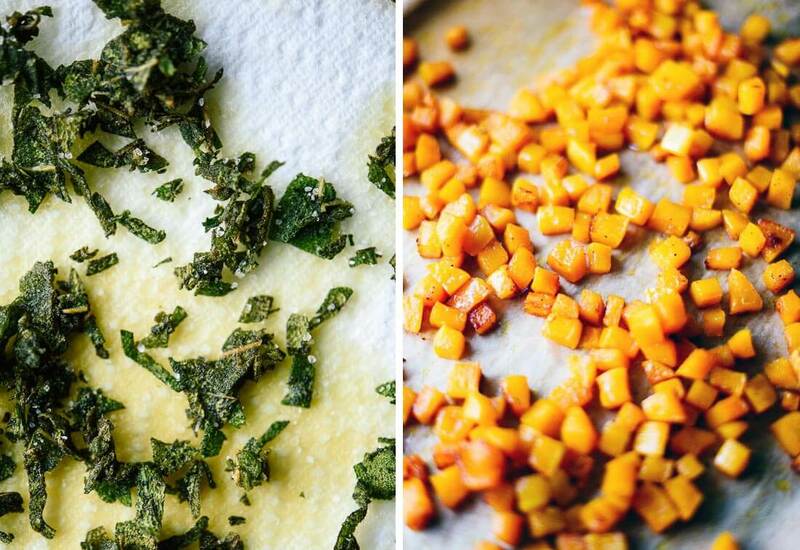 Roasted butternut squash and crispy fried sage take it over the top. This risotto is also healthier than most, since it calls for brown rice instead of white, and requires practically no stirring. You can just bake it all in the oven! Recipe yields 4 servings. Recipe adapted from my cauliflower risotto recipe. See all of my risotto recipes here. 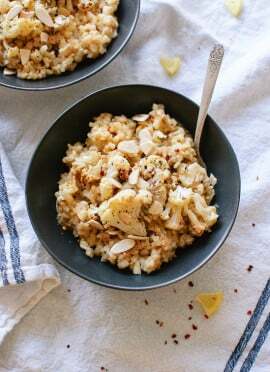 Make it dairy free/vegan: Starchy rice accounts for most of this risotto’s creaminess, so you can skip the dairy or replace it with the following. Replace the butter with vegan butter or a tablespoon or two of additional olive oil, to taste. Skip the Parmesan cheese. You might like to add some nutritional yeast for cheesy flavor. *A note on Parmesan: I always get a few comments on recipes that include Parmesan (“It’s not vegetarian!”) but Whole Foods actually makes a great animal rennet-free Parmesan. There’s plenty of flavor in here without the Parmesan, if you’d rather leave it out. Made this last night and it is ridiculously good! Glad I weighed my butternut squash in at 2 lbs because I didn’t have any room left on my pan. Skipped the wine and served it with wilted swiss chard with a squeeze of lemon, we’re finishing it off this morning with fried eggs and a side of pan seared zucchini and tomato wedges, so comforting! Perfect recipe, will be making this again for sure. This risotto is absolutely delicious. I made it for dinner last night and at first my husband was a little suspicious of all the butternut squash. He felt the ratio of squash to rice looked completely out of balance. Just too much butternut squash for him he said. Once he started to eat it though, he changed his mind and really liked it. It was soo good and creamy. Plus how nice not having to stand there and constantly stir the risotto. It was very convenient to just bake it in the oven. I will definitely make this soon again. Lucky for me there was a little bit left over even though my son had two large servings so I will get to enjoy it for lunch today as well. Win! Thank you for sharing, Annika. I appreciate your review! This recipe was wonderful! Thank you for sharing all these vegetarian recipes. 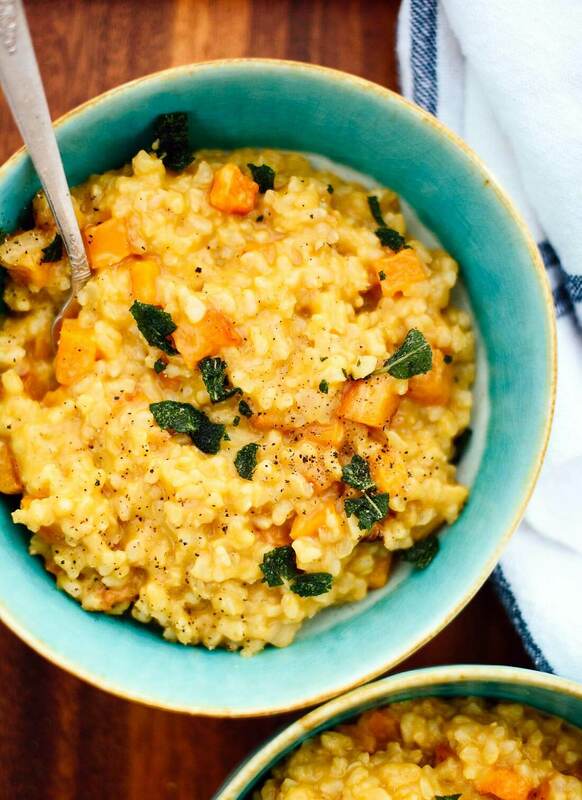 I plan on making the Roasted Butternut Squash Risotto again for Thanksgiving. Could I use barley in place of rice? Hi Carolyn! It might be worth a shot, but I’m not sure if the liquid to barley ratio or baking times provided will be quite right. Ended up making for Thanksgiving and it turned out great did use a little less barley to greater liquid ratio. Thanks for a great recipe and leftovers! I made the vegan version tonight for dinner. Absolutely delicious! Added a little fresh ginger with the garlic. Thank you for sharing! Will be making this again for sure! Do you rinse the rice before putting it in the pot? Does that matter? Thanks! Hi Sally! No, you don’t want to rinse rice before cooking risotto, since you’ll rinse off some of the starch that makes risotto so creamy. Will this recipe work just using a casserole dish rather than a dutch oven? Hi Monika! If you don’t have a Dutch oven, you can prepare this risotto in a large saucepan on the stove, then carefully pour the boiling broth and rice mixture into a casserole dish. If the casserole dish has an oven-safe lid, use that; if not, cover it tightly with foil. Bake as directed. Any advice if you dont own a Dutch Oven? If you don’t have a dutch oven, you can use a large soup pot that is oven safe with a lid if you don’t have a dutch oven. I hope this helps! This recipe was absolutely delicious! The only modification I made was to fry the sage in the 3 tbsp of butter, then stir the sage infused butter in to the risotto at the end. I couldn’t get the sage jeto properly crisp up in just a bit of oil. Thanks Kate, this recipe is tops! 5 stars! And I love your book as well! Hi Kate! I am definitely making this! :) When you say arborio rice/short grain brown rice, are they interchangeable? Can I just use short grain brown rice? Hi Katrina – Great question! Yes, you can use short grain brown rice for this recipe. Happy to hear that :) They are good and hearty! 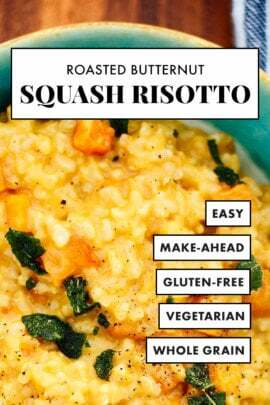 i love the butternut squash risotto. We make it all the time! i bought 4 copies of your cookbook! I kept one and gave the others to my grown kids. The younger two will get it when they are on their own. We have tried several recipes and are loving it. Thanks. Thanks to your blog i purchased several earlywood utensils! Thank you so much for your support, PJ! Hi Kate, thanks for helping me be a vegetarian, this was the first risotto I cooked and it went perfectly! Just wondering if there is any dry herb I could use instead of fresh sage? As I’m getting started on this cooking mylarky I find I buy fresh herbs, don’t use the half of them and there is a lot of waste. If fresh is best, is there an alternative to sage? Many thanks. Karen. This is great with fresh sage. :) The toasting of the sage to top with is wonderful. You could always omit the topping if you would like. Thanks for the review, Karen! Made this today but subbed Sage for Thyme and added spinach and portabello mushrooms to up the veg content. Was awesome! Hi, Anna! Those sound like delicious additions. I’m happy you liked it, and thank you for the review! Glad your additions worked well! Thank you for sharing, Mare. Great recipe, super delicious and hearty (even without the cheese!) I did zjoush it with freshly squeezed lemon juice right at the end and some fresh arugula to lighten it up a bit! GREAT idea! I did make a few changes- my daughter loves farro so I did 2 parts parts, 1 part arborio. I was worried it would be too nutty or crunchy but I just cooked it until is was smooth and yummy. My son makes what we call “garbage broth”- he saves up carrot peels, onion peels, well ANYTHING you’d wash and then throw away but he keeps it and then he cooks it like mad, and we harvest the broth, so that was our rich broth to cook the rice in. I’m too lazy to peel and cube squash so I briefly baked 2 whole unpeeled squash halves and then scooped them off the rind (more garbage broth material!). Did the salt/pepper, red pepper, sage, wine, and vegan butter as you suggested. Three of us had with parm, 1 with vegan parm and OMG it was good, REALLY REALLY good. The squash was just awesome and the risotto was smooth and delicious. We had with sauteed dandelion on the side and criso vino bianco. It’s the best meal I’ve cooked in months. BTW I find your recipes always have nice flavor balance. Thanks! Thank you, Janet for sharing! I’m happy it worked with farro. I always get risotto wrong, but this recipe was amazing. It came out perfectly, creamy but not runny and full of flavour. I used white arborio rice and it was perfect. Thank you! Wonderful, Rebecca. Thanks for your review. I made this for Thanksgiving last year and will make it again in the near future now that butternut squash is once again abundant and cheap. Yes, I made it for Thanksgiving. No turkey, no potatoes, no casseroles. Just this. It was all we really needed, actually. Both SO and I put the first forkful (okay, fine… spoon. I’m a little kid and eat with a spoon), looked at each other and said, “oh my God.” It was sensational. I didn’t bake it because I don’t have an ovenproof pot, so I nstead, I pored over the pot, stirring endlessly while I dabbed my brow thinking, “this had better be good.” It was. It was so, so worth it. I love that! I’m glad it was worth is and will be a new Thanksgiving tradition. So happy to hear that! Thanks for sharing, Adi. This has become one of our favorite no-meat dinners. We use white aborio, because that’s what I usually buy. And have had it with and without the sage. It’s delicious. Filling and so satisfying. Great to hear, Laura! Thanks for commenting! This is a go-to recipe in our house because it’s so simple and delicious. We’ve found that it works well with any winter squash (butternut, acorn and carnival (although both are a pain to peel! ), delicata, and, in a pinch, sweet potatoes), and I’ll confess to using a dry rose when I didn’t have another wine in the house. We usually divide into six servings and have the leftovers for lunch (it reheats wonderfully) during the week. I’m very picky about risotto (because, let’s be honest — when it’s not good, it’s pretty much like rice you didn’t bother to drain), and with the exception of one restaurant in Aosta, this is my favorite (and that includes the risotto we had in Venice). 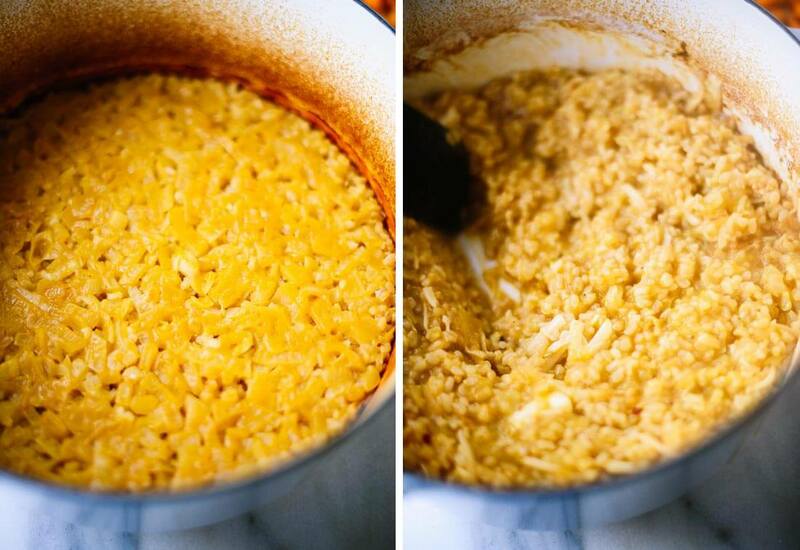 Thank you for sharing this cooking method — it seems to be the key to perfect (and easy!) risotto! Hooray! I love that you have tried other variations and this method meets your risotto expectations, Jennifer! Thanks so much for sharing. Is there a different vegetable that would taste good instead of squash or cauliflower? 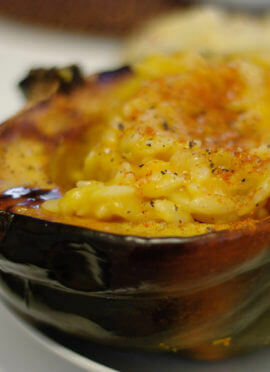 Sadly We don’t get squash here and not a big cauliflower fan but the recipe looks so good. I believe some readers have had great luck with sweet potatoes! YUMMMMMMMMM!!!!!! We got our first fall farm box yesterday and this recipe used so many delicious, fresh, ingredients! I threw in a bunch of kale just after the garlic and omitted the sage. My picky 7 year old ate his entire bowl before I had time to ask him if he liked it; he gave it an enthusiastic two thumbs up (we ALL did!!!). Thank you! Win! I love that he liked it so much. :) Thank you, Jessica! OH MY GOSH! I didn’t even clean up my dishes before posting this review. This is decadent, rich, flavorful and so filling. Easy to make (and most of it’s just in the oven!) and absolutely DELISH! I am a big risotto fan but this had a more rich, creaminess about it than even my most favorite Italian restaurant versions. If you’re reading this and have found risotto to be ‘flavorless’ in the past– fear not, this is AMAZING. Thank you Kate! That’s too funny, Emily! Thank you for commenting and for your review. I love how making risotto has now become almost lazy ! Thank you for the recipe, and cheers to all those great autum cooking session ! After the first bite I wanted to grab the entire pot and stuff it all in my mouth at once. AMAZING! And so simple to do instead of standing over the stove to fix the risotto! I did have to use acorn squash instead (my store didn’t have any butternut. In November. There is something seriously wrong with my store) and I didn’t read closely enough and just used white Arborio rice. Other than that I followed the directions exactly and it turned out great! I’m glad you love this one, Allison! Thanks for your review. Hi there! I’m hoping to make this with my turkey for Thanksgiving. The turkey is supposed to cook at 350, and for the risotto I’m using white arborio rice instead of brown. Do you think it would be best to cook both dishes at 350, 375, or in between? Also, I’ve made this a few times before– it’s so easy and DELICIOUS! Thanks very much!! I’m not an expert when it comes to turkey, so I’m not sure there! White rice overall doesn’t typically take quite as long. You will need to keep an eye on it. Question for you – can this be make in a crock pot? I’m going to my in-laws for Thanksgiving this year and the ovens and stoves are going to be full with other dishes. You’re welcome! You know, I’m not 100% sure as I haven’t tried it. I haven’t ever thought of trying it in a crockpot. If you do, let me know how it goes. I’m happy to hear that, James! Thanks for sharing! This was fabulous and shockingly easier than making risotto on the stove. I couldn’t believe how creamy it was. Thank you for this! It’s so creamy! I’m glad you liked it. Hoping to make for supper tonight but I only have regular long grain rice. Is that a problem? New to risottos. I looked it up and am getting mixed advice-as it usually goes:) love your recipes and always know they will be good! Short grain really works best here. Let me know what you think, Leah! Made it earlier in the morning and transferred the risotto to a crock pot set to warm. After an hour added a little lite cream and mixed. This recipe was delicious even sitting in the crock pot for a few hours. Sure! It’s best served immediately but you can also serve it as leftovers. Reheat portions as needed. Or, in the stove. Just made this for Thanksgiving for a nephew who is vegetarian. It looks great, tastes great, although I think I will skip the wine next time–the parmesan is such a great taste that’s altered a bit by the wine. But the big thing is that I doubled the recipe for 8, and I could feed 15 with this amount! Can’t wait to see what the reaction is tomorrow. Happy Thanksgiving! If you made it today. Are you reheating for tomorrow (Thanksgiving day)? If so how are you reheating. I’m thinking of a crock pot on warn. Hi Kate! This recipe was really good even though I messed it up :) – maybe you can put the warning about white rice at the top, I read it after I’d already cooked it for too long. I also agree with the person who made a comment about the wine – I used cheap cooking wine and probably should have used something nicer since it didn’t have the chance to cook off. Thanks! Oh no! I’m sorry that happened with your rice. It is really nice with wine, but you can also make without and it’s still delicious. Thanks for sharing your experience, Courtney! Hi, big fan here. I know Kate advises against regular brown rice, but has anyone tried it? Hi Lori! Your risotto won’t be as creamy like mine because short grain rice has a special starch that contributes to creaminess. So, I’m afraid you might be disappointed. I made this for Thanksgiving because I was looking for something hearty to take home to my meat-eating family – I turned vegetarian about 5 months before. It was an instant classic, and practically every female in attendance asked for the recipe! I am making it again for an office pot luck tomorrow and I have full confidence that it will be amazing yet again. This recipe is printed and in my recipe book for life. Thank you! I love that! Thank you, Eric. I really appreciate the review. Excellent, relatively easy and worth what effort it does take. Hooray! I’m happy to hear that. Thanks for the review, Leslie. 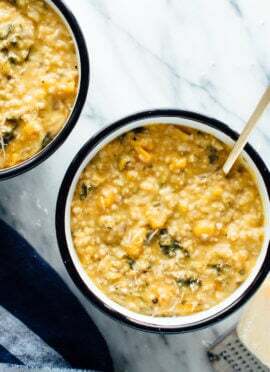 Hello, Kate–I was looking for a brown rice risotto recipe + way to use CSA winter squash, and this totally delivered! Not a vegetarian so used chicken stock that I had, and crumbled dried rather than fried sage leaves, but in any case, a total winner! I’m glad you loved it! You should try my mushroom risotto recipe too. It’s so good! This was really tasty! I used one chopped leek instead of the onion & added 8oz. sliced Cremini mushrooms (sauteed) into the finished product. I added the sage in at the end also, didn’t garnish with it. So happy I didn’t omit that ingredient! Also added a squeeze of fresh lemon before serving. I thought I had blown it when I took the Dutch oven out of the oven. It looked so dry & stuck to the bottom of the pan. Not burned, but some areas were “crunchy.” After adding the cup of broth, Parmesan, wine & butter, it rehydrated really well & was smooth as silk. I did need to add a little more water at this point. Home run!! Thanks for a great recipe & awesome cooking method. I’m making this tonight for the fifth time (at least). Always a hit ! Hey! I was wondering if I can make this with a slow cooker instead? I wouldn’t recommend making risotto in the slow cooker, but you could see if others have by checking the comments. I wonder if some toasted bread crumbs seasoned with garlic or miso or toasted nuts like pepitas and sliced almonds could satisfy vegetarians avoiding cheese. I’m looking forward to making this tonight AND you have saved me from having to grocery shop today. Yay! You could try it, but the cheese really brings this together. Did you try it, what did you think? FYI- came out beautifully. I took my own advice andtopped with some toasted walnuts which I had on hand AND the cheese, because cheese is awesome. IT was delicious and easy (great method). Thanks! I’ve made this recipe a few times – it’s so creamy and comforting! The most recent time I didn’t have stock on-hand so I just used water and doubled the onion and garlic to make sure the flavour didn’t suffer. It worked great! Thanks for your review, Cara!